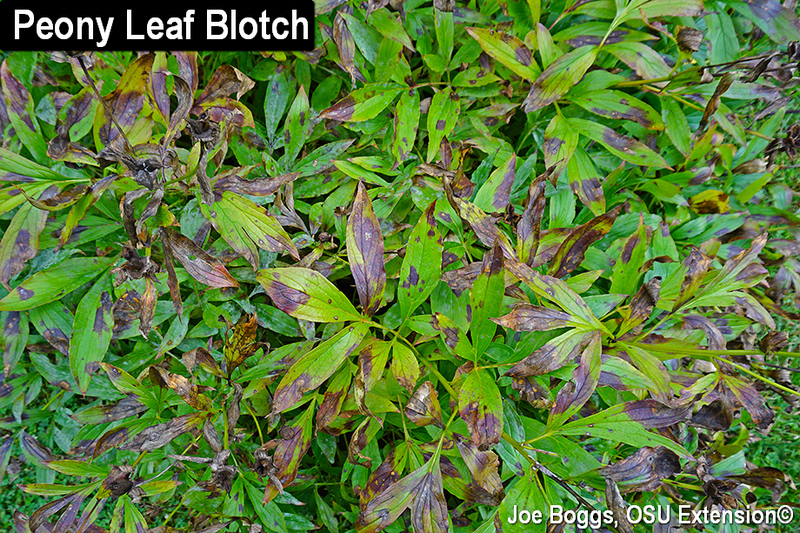 Peony leaf blotch disease is caused by the fungus Graphiopsis chlorocephala (formerly Cladosporium paeoniae). The fungus produces diseases with different names depending on the symptoms. Leaf blotch occurs when infections produce large, shiny, brown or purple leaf lesions. Peony "red spot" and "measles" occur when fungal infections produce distinct red to reddish-black spots on the stems. Typically, the measles symptoms appear before the leaf blotch symptoms with the stem lesions expanding as the season progresses. Peonies are also susceptible to a specific gray mold fungus, Botrytis paeoniae. The fungus may infect newly emerging shoots in the spring covering them in a fine, velvety gray mold. The Botrytis can also infect flower parts later in the season to produce "bud blast" with flower buds failing to open and "flower blight" with opened flowers collapsing and becoming blackened. Fungal infections can also move down the stems to produce a "shoot blight." Unfortunately, web searches may yield reports with images that clearly show peony leaf blotch but are mislabeled "Botrytis blight," or images of Botrytis infections that are blamed on the leaf blotch fungus. These fungi have very different disease cycles. Of course, it's not unusual to find both diseases on the same peony plant. The good news is that these diseases are not considered to be killers of garden (herbaceous) peonies. Symptoms tend to escalate as the season progresses meaning plants apparently have enough time to produce and store enough carbohydrate to support regrowth the following season. However, both of these diseases can seriously detract from the aesthetic value of peonies in landscapes meaning there is value in trying to halt infections and subsequent symptoms. The Disease Triangle illustrates the three conditions that must be met for a plant disease to develop: the pathogen must be present; the plant host must be susceptible to infection; and environmental conditions must be present that support infection and disease development. Removing only one of these conditions will prevent disease development. Various web reports on peony leaf blotch recommend planting less susceptible varieties; however, I have found no scientific publications presenting data from plant trials that assessed disease susceptibility. There are anecdotal accounts that susceptibility varies among the different peony varieties and I've observed this in peony plantings. Of course, other factors may be responsible for varying levels of infections such as micro-environments acting to increase or decrease infections within the plantings. Some disease suppression may be achieved by environmental management such as avoiding overhead irrigation. However, it's difficult to manage natural overhead irrigation in the form of rainfall. Suppression of the pathogen by fungicidal applications can be effective; however, success is generally problematic. Multiple applications are required over a significant portion of the growing season and heavy rainfall events can mean a shortening of the intervals between applications. Relying on fungicides alone is not likely to be successful for home gardeners and can even present a serious challenge for landscape management professionals. Removal of the plant pathogens through sanitation is one of the effective management strategies for both of these garden peony diseases. This approach focuses on getting rid of infectious tissues that harbor the fungi throughout the growing season or over the winter. A. Cut, remove and destroy all of the top growth down to the soil line. B. Rake, remove and destroy all mulch and plant debris that was beneath the infected plants. C. Redistribute new mulch for the winter to a depth of no more than 2 – 3". This will suppress the release of fungal spores next spring from infectious debris that may have been missed during the fall clean-up. Protect new shoots using an appropriately labeled fungicide. The product label must include the site (e.g. landscape, nursery, etc.) and make certain peonies are not listed as being sensitive to the product. This is an added protective measure and requires just one or two applications. I have heard a number of anecdotal accounts of peony leaf blotch being successfully managed without these fungicidal applications in the spring. However, these applications should be considered if there were heavy Botrytis infections this season. A. Remove and destroy bloom buds, flowers, and stems showing signs of Botrytis infections. "Dead-heading" spent flowers is also recommended. B. Selectively prune plants to improve air circulation which will enhance leaf and stem drying. C. Avoid overhead irrigation; use drip irrigation if available.